In Tacoma, teachers voted to strike Thursday if a deal with the district is not reached. 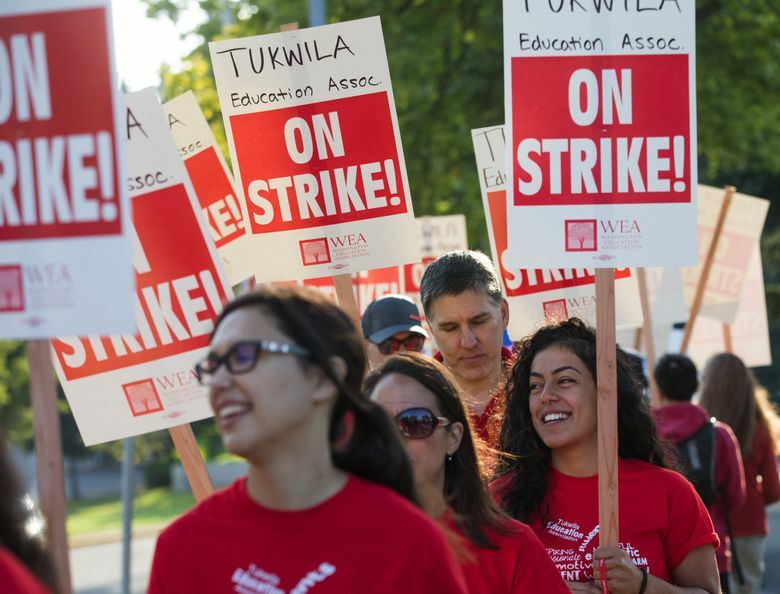 Teachers in Centralia, Puyallup and Tukwila school districts went on strike Wednesday. 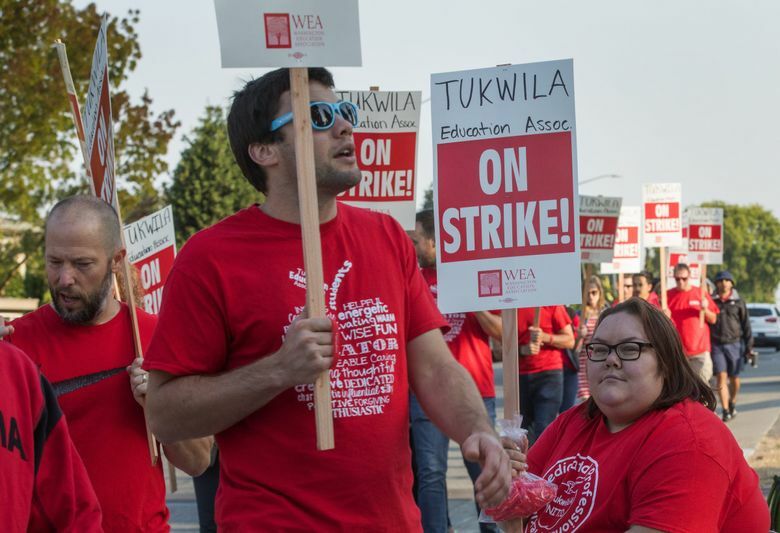 Teachers in Centralia, Puyallup and Tukwila school districts were on strike Wednesday, canceling the first day of school, after negotiations between their unions and districts failed to reach agreements. In Tacoma, teachers said they planned to strike on Thursday after they failed to reach a deal with the district. Some teachers unions and school districts came out of the holiday weekend with tentative contract agreements, ending strikes in Southwest Washington’s Vancouver, Ridgefield and Hockinson school districts and preventing looming strikes elsewhere. Teachers in Thurston County’s Rainier School District were on strike Tuesday but reached a tentative agreement with the district and will return to school on Thursday, two days later than planned. It’s been a tumultuous summer for teacher-contract negotiations; teachers unions in several districts threatened to walk out or go on strike. The chaos came after state lawmakers allocated about $2 billion for educator salaries to comply with a 2012 ruling by the state Supreme Court known as the McCleary decision, according to the Washington Education Association. Teachers visit families at home in 700 communities nationwide. The idea is earning attention in Seattle. 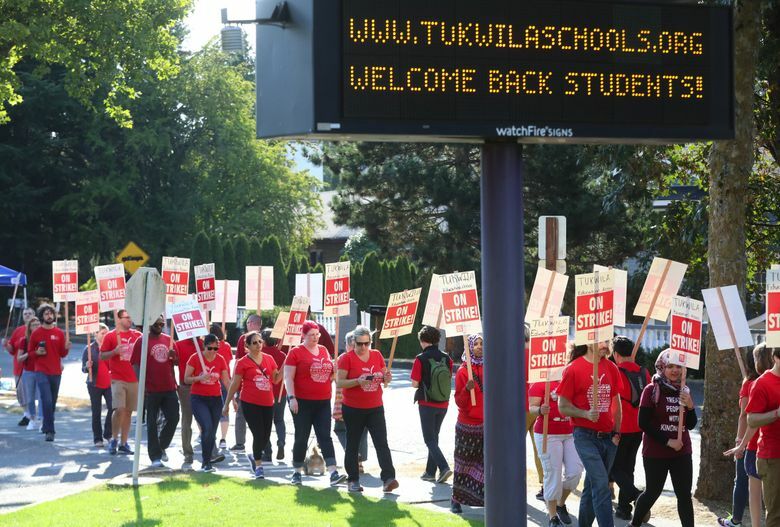 Both Tukwila and Puyallup school districts passed resolutions to authorize legal action against individual employees participating in potential work stoppages. Centralia School District will vote Wednesday evening on a similar resolution. Public employees aren’t explicitly allowed to strike under state law. Former state Attorney General Rob McKenna interpreted the law in 2006 to mean that the state could not punish striking school-district employees but could get an injunction against the union through the courts, according to the Yakima Herald. The Puyallup School District’s website quotes McKenna stating that disobeying an order to return to work could be seen as contempt of court and result in a fine. On Tuesday, 97 percent of Tacoma’s teachers voted to strike if no agreement was reached before the first day of school Thursday, even after district representatives wrote increases in salaries had been proposed. On Wednesday, the district announced Thursday’s class would be canceled due to failed negotiations. The Arlington, Conway, Monroe, Sumner, South Whidbey and Wapato school districts negotiated with teachers over the holiday weekend, reaching tentative agreements that will allow school to start on time. On Friday, the union representing Seattle Public Schools teachers reached a deal that will see their salaries increase by 10.5 percent, and teachers returned to classrooms Wednesday for the first day of school. While the raise for Seattle teachers may appear hefty, neighboring districts have agreed to even higher salary bumps. Teachers in Bellevue, Lake Washington and Snoqualmie Valley schools will soon see their paychecks rise by as much as 14-25 percent under new contracts. Staff reporters Tan Vinh and Agueda Pacheco-Flores contributed to this report.